Ther. 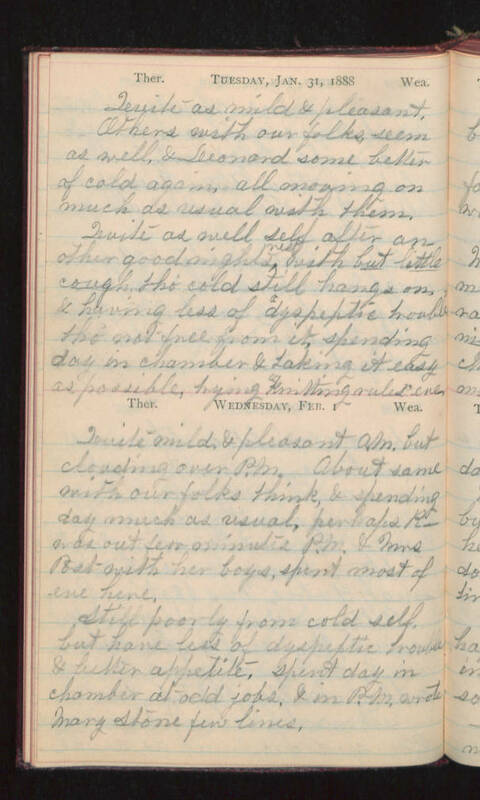 Tuesday, Jan. 31, 1888 Quite as mild & pleasant. Others with our folks seem as well, & Leonard some better of cold again. All moving on much as usual with them. Quite as well self after another good nights rest, with but little cough, tho' cold still hangs on & having less of "dyspeptic trouble" tho' not free from it, spending day in chamber & taking it easy as possible, trying "knitting rules" eve. Ther. Wednesday, Feb. 1 Wea. Quite mild & pleasant A.M. but clouding over P.M. About same with our folks think, & spending day much as usual, perhaps R_ was out few minutes P.M. & Mrs. Post with her boys spent most of eve here. Still poorly from cold self, but have less of dyspeptic trouble & better appetite. Spent day in chamber at odd jobs, & in P.M. wrote Mary Stone few lines.